This fabulous pillow was design and hand embroidered in Hidalgo, my home state by the Lopez Family. 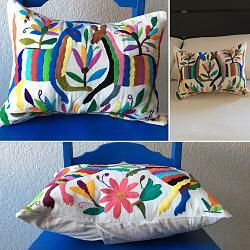 100% Cotton (Mexican Manta). Multi colored design . MEASUREMENTS: 16 in x 12 in App. MADE IN: México INDIGENOUS GROUP: Otomí. CUSTOM ORDERS are always welcome. Please email us your preferences. FREE SHIPPING WITH IN THE USA.